Usher in the Christmas season with exciting gourmet goodies in special canisters from Mrs. Fields to give away to your loved ones. Mrs. Fields veers away from the traditional Christmas gift items by offering all-time favorite cookies, nibblers, brownies, muffins, and mini muffins in Christmas-themed gift canisters and special boxes! 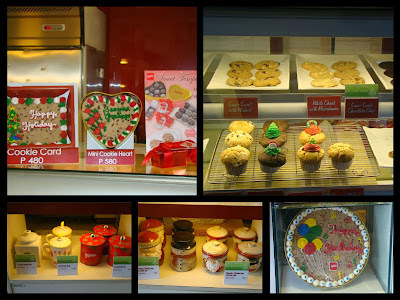 For this Yuletide season, Mrs. Fields will save you from the hassle and worries of finding that perfect edible gift. Choose from a wide variety of Christmas Biscuits and the must-try Big Cookie Cakes that can be personalized with heartwarming messages. Each bite of these goodies will remind you how merry your Christmas can be. At a loss on what exactly to give this Christmas? Get the Mrs. Fields gift voucher. It's a must have for the holidays to come. Choose between P100 or P250 vouchers to give out and let your loved ones pick the present they want to have. These luxurious boxes are special keepsakes delicately handcrafted to keep sweet Christmas mementos when the goodies are gone. Fill them with delectable bakes sealed with a heartfelt Christmas note. Give them to your loved ones and let them choose the Christmas treat they would love to have! Choose between P100 or P250 worth of Gift Voucher. A favorite for special occasions. This Christmas-themed colossal cookie cake can be personalized with heartwarming messages. Send an email to order@mrsfields.com.ph or call Mrs. Fields Marketing Department at 886-6774 loc. 121 for inquiries or orders. You may also call the Mrs. Fields store near you.